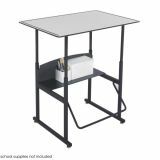 With its patented Swinging Pendulum Footrest Bar, the AlphaBetter desk is giving students the ability to sway through their school day. 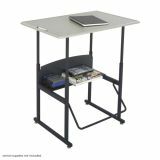 The desk and footrest bar allow students to stand and move, helping to burn excess energy and potentially help them to focus. 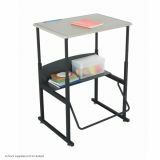 Designed for students in grades 3-12, it easily adjusts from 26" to 42" high to allow the choice to stand or sit while in the classroom. the (28" x 20") MDF top is covered with an extremely durable 5/8" thick thermoplastic laminate. Lower shelf provides additional storage of books and supplies. Studies have shown that moving may help increase academic abilities, facilitate learning and that fidgeting may help burn extra calories. 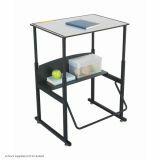 The patented Swinging PendulumTM Footrest Bar (fidget bar) can enable students to keep moving while redirecting fidgeting behavior, expending energy and helping students focus on classroom activities. Height adjusts from 26" to 42". 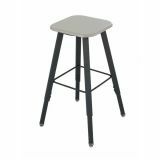 This tip-resistant stool adjusts from 21" - 35.5" and is built to last with a steel frame and sturdy 13" square seat. Lock it up with style! 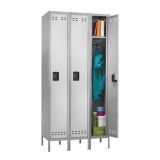 These contemporary two tone lockers will fit into any environment. Choose from a single, double or six tier compartment. Strong, one-piece uni-body design boasts a heavy gauge all steel construction so it can stand up to tough conditions in any environment where extra, secure storage is needed. Units can be used as stand along or can be linked together. Users provide their own padlock for maximum security. 36"W x 18"D x 78"H. Available in gray or tan. Anti-burst exercise ball. 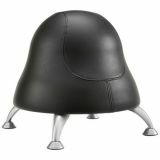 Fully inflated, seat height is 23". 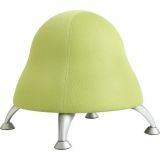 May help children stay active and support better posture and balance. Pump included. 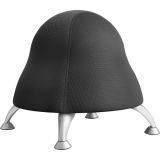 Zenergy and Runtz ball chairs provide movement that may help you concentrate and support better posture and balance.